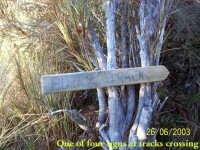 Click boardwalk history for account about the original Leith Saddle Track and the establishment of the boardwalk in 1993. For our Club’s part in the boardwalk venture see boardwalk for an ODT account of its construction. Cars park off motorway at Leith Saddle yard (alternatively down side road at bridge (restricted space). 25 km from car park. Walk across side road to track. Going further: along road past doppler radar to DoC sign. 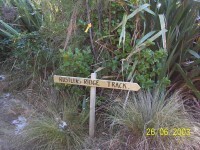 Right along Rustlers Ridge track to junction with Burns Track. 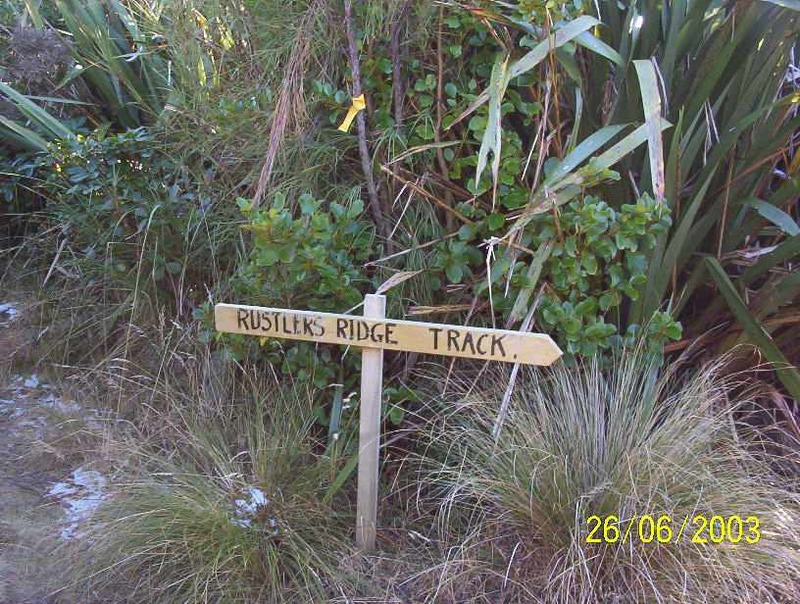 Burns/Rustlers circuit Maintained by Green Hut Track Group. DCC land. 32. 6/9/2017. Both. 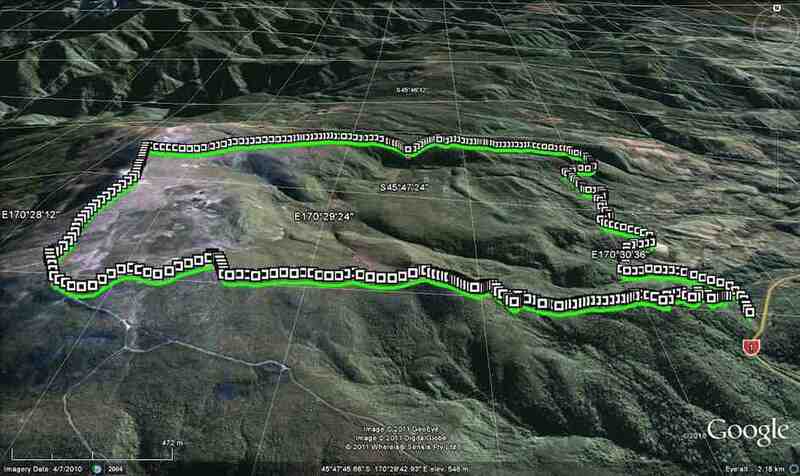 Leith Saddle, Swampy, Burns, Pipeline Tracks circuit. M. Leaders: Betty and Jim. A total of 33 persons started. 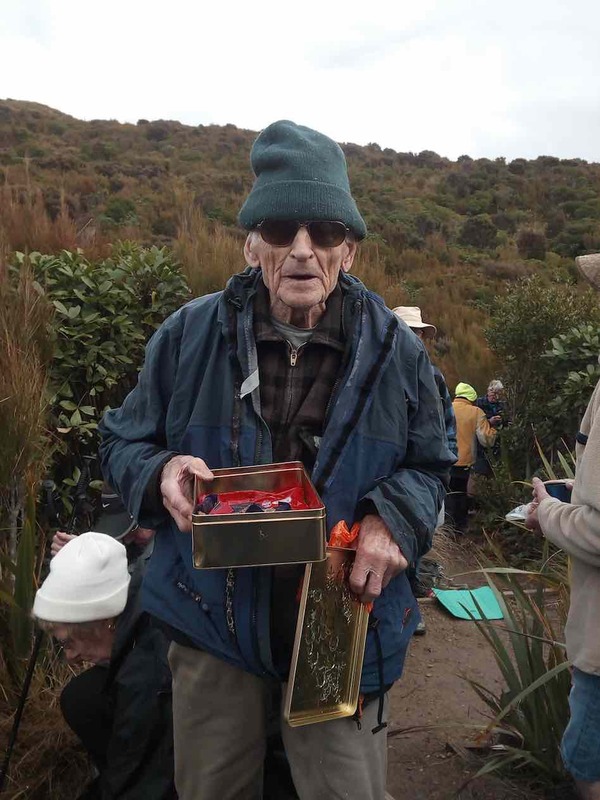 The total party walked to the Lookout Point for morning tea and at this point George Haggie served chocolates to celebrate his birthday. Some of the party turned back because of the increased steepness and slipperiness of the track caused by recent rain. From this point 15 trampers split off and forged ahead for an extended tramp that brought them down to the gravel road and back to the cars at the saddle. 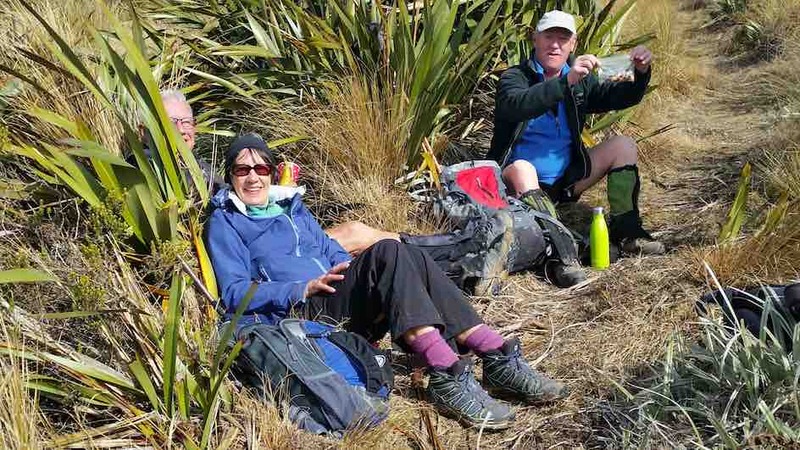 7 hikers had lunch at the micro wave tower at the summit before returning to the cars at the Saddle where they met up with the members that had returned earlier. We then adjourned to the Plaza Cafe and the tramping party arrived a short time later. Cell phone coverage to stay in contact with the split up groups was of assistance. – Betty and Jim. The combined group split after morning tea on the Leith Saddle Track, 15 trampers forging ahead to go further. 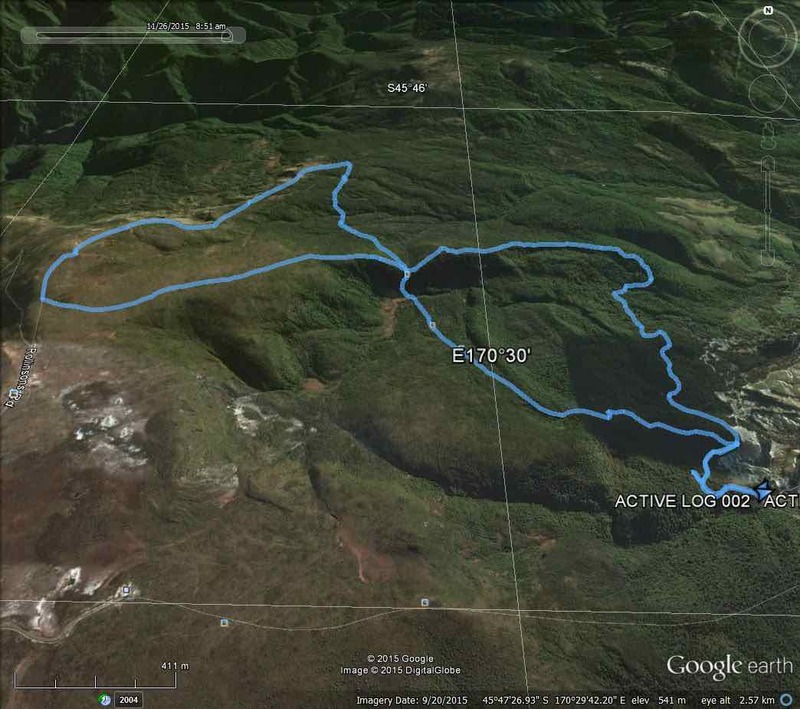 …and decided to carry on to Swampy Summit and do a circuit instead of returning down the same track. The breeze up top was decidedly chilly but the views were superb – 360 degrees. Whichever way you looked there was something to see. We rested briefly beside “The Space Ship” (Aviation V.O.R. 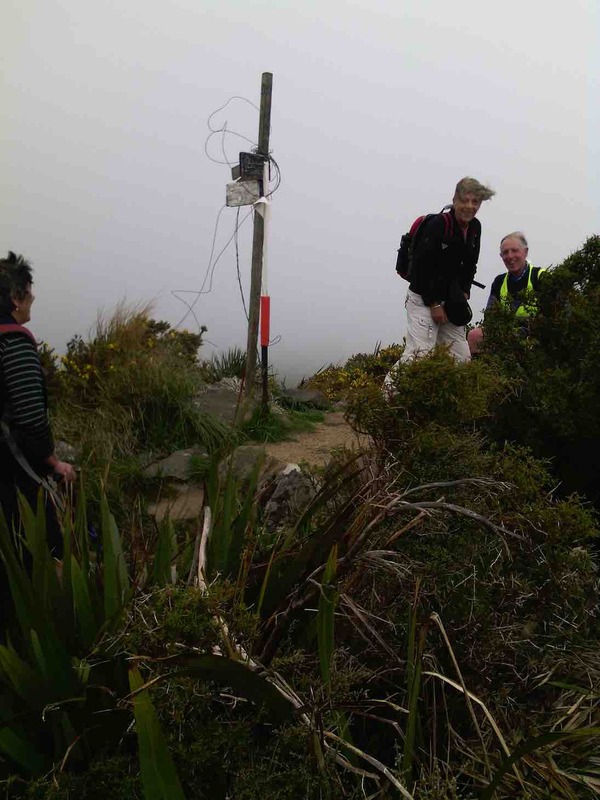 Beacon) at the highest point of Swampy while Neil2 explained its use. 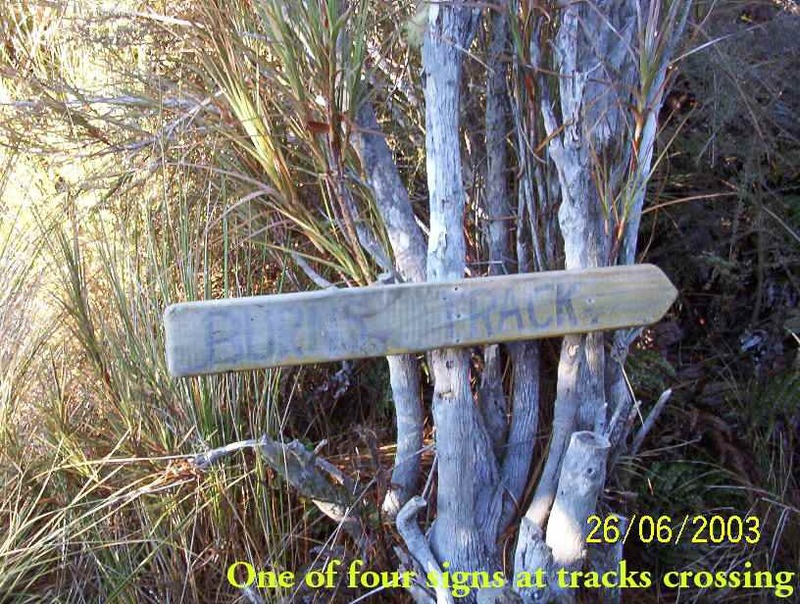 Further on we turned off onto the “Access Track to Burns and Rustlers Tracks” – so the sign stated. Wouldn’t it be simpler to call it “Rustlers” Track – or would that not be logical? and still with nice views to the north-east. 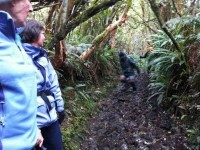 Further down, the track was a bit slippery in the bush but we soon came to the Junction. It is some years since I was last on the lower half of Burns Track, and had forgotten how much pleasure could be had while slip-sliding down the first steep and muddy part. 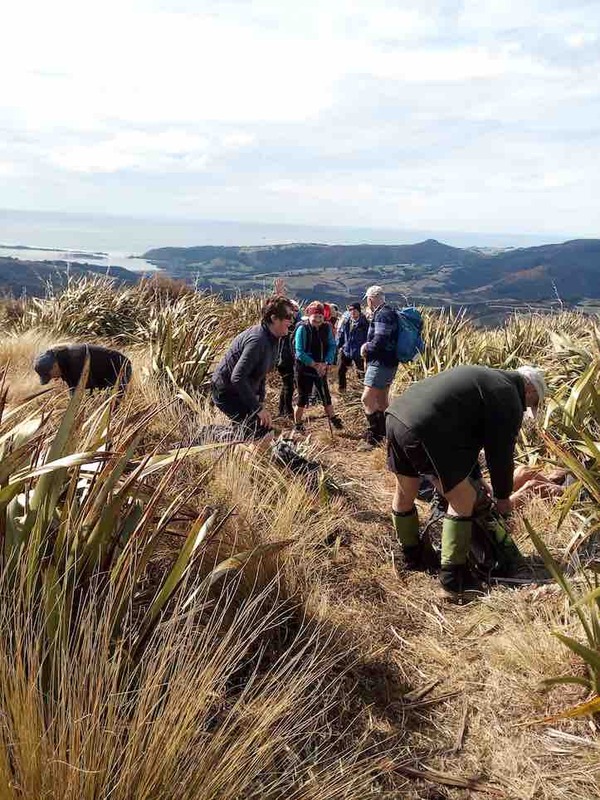 There were also some muddy patches further down, and several members of the group made the most of the opportunity provided to add some mud to their clothing, etc. 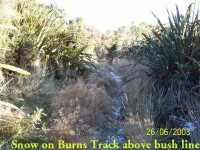 However, most of the Burns Track was very pleasant. At the bottom it was along the Pipeline Track and then the road for a kilometre to gain the cars where they had been parked. 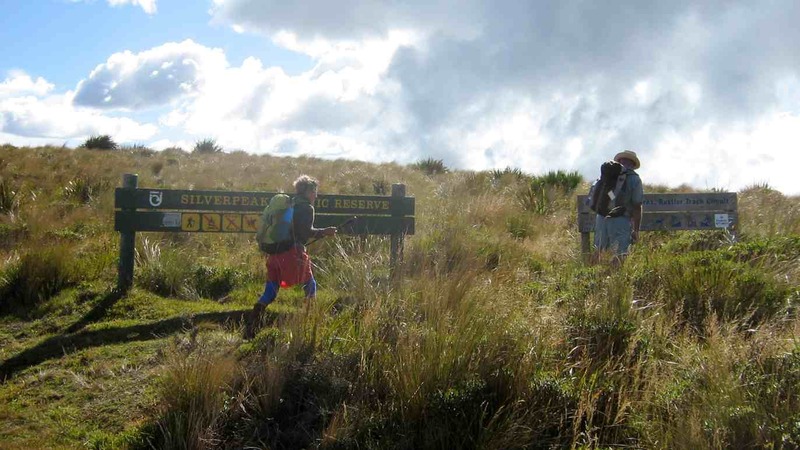 Today’s tramp had provided a good variety – bush tracks, tussock, and views – what a great day it had been. Distance – 10.8 km. The hikers had already returned, so most of the trampers followed to rejoin them at the Stadium’s coffee shop to complete the day. – Art. 31. 23/11/2016. Trampers. 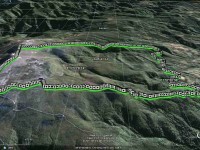 Leith Saddle, Swampy, Rustlers, Pipeline Tracks circuit. M. Leader: Arthur. 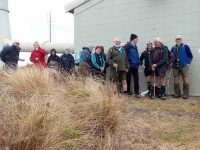 It was a bit of a shock to the system when we climbed out of the cars at the Leith Saddle carpark beside the Northern Motorway. A cold wind was funnelling up from the south, bringing low cloud with it. 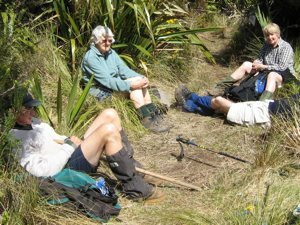 But the Leith Saddle Track was nice and sheltered and we soon warmed up as the first ten minutes had a distinct uphill flavour to it. A good gravel track, with nice native forest to enjoy. Lot of ferns too, but not much birdlife today. We reached the observation point at about 10.00 a.m., but the only view we got was of lots of cloud. 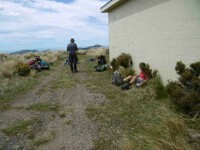 We had our morning tea in the shelter of the vegetation close by. As we climbed higher the low cloud cleared a little and we could get the occasional glimpse of the city, and back towards Blueskin Bay. 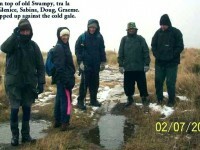 when we reached ‘Swampy Spur Trig S’, which is quite exposed. 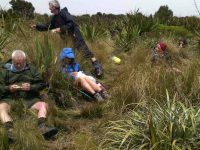 Otherwise the track was more sheltered till we reached the microwave, where we found a group of six trampers having their morning tea. A five minute stop with them was taken. They had proceeded us up the track, but were returning by a different route to us. From the microwave we had a half hour road walk on top of Swampy. 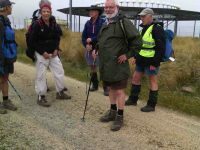 We kept moving as the wind was rather coolish, but we could get quite a good view down over Mosgiel and the Taieri, if a little hazy. The weather seemed to be clearing a little and we could get a good look at the Silver Peaks. We stopped a little early for our lunch, while there was still a good view of Blueskin Bay. Unfortunately a light shower arrived while we were eating but we were well hunkered down in shelter. A chocolate treat from birthday girl, Judy K, keep our spirits up. – Thanks, Judy. 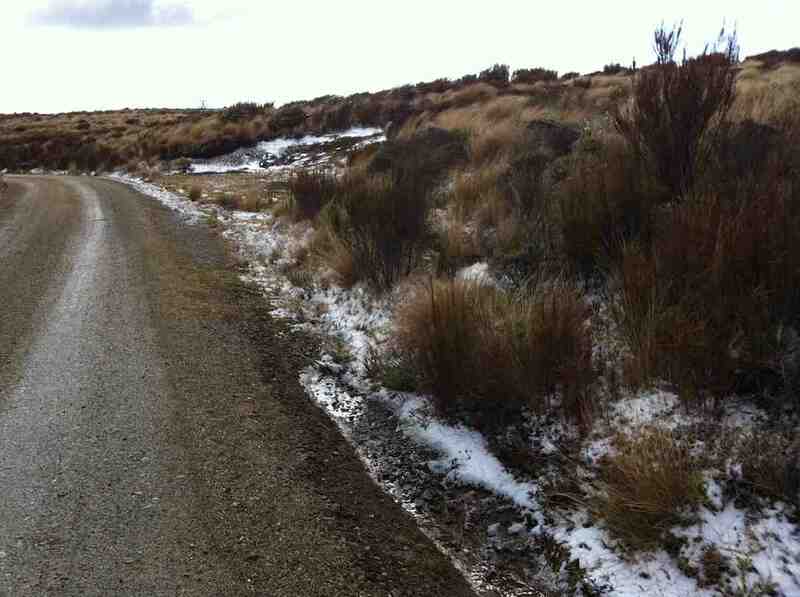 Only a few minutes’ travel got us to the junction with Burns Track. We continued down Rustlers, eventually reaching the Pipeline Track which would take us back in the direction of the cars. The Pipeline Track had a few muddy patches on it, but also some very pleasant parts. The rocks were a bit slippery when we crossed Burns Creek, and we were soon out onto the road for the last kilometre or so. 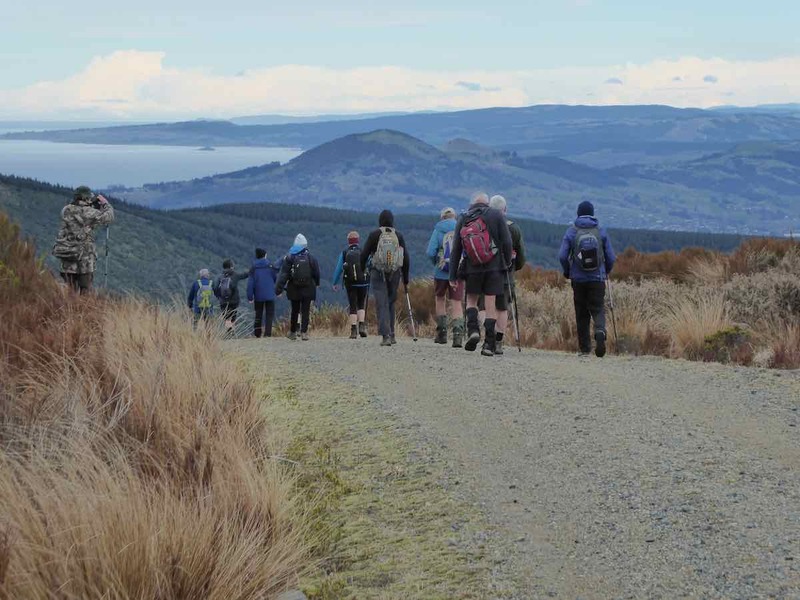 The eight trampers out for the day’s fun had walked 12.1 km – a good training day for the tougher tramps coming in the next two weeks. And it had been an enjoyable day’s tramp. Moving time was 2 hrs 40 mins. It came on to rain lightly as we got back to Dunedin, where we stopped at the Hot Chocolate Shop (some did have coffee though). 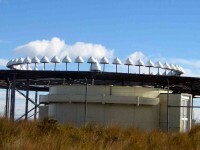 And then back to Mosgiel, all fired up for next week. – Art. Today, we did a tramp that maybe only one member of the group had done before. 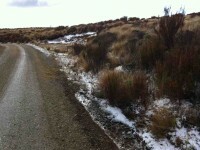 We started off at the beginning of Burns Track from the Leith Valley Rd. 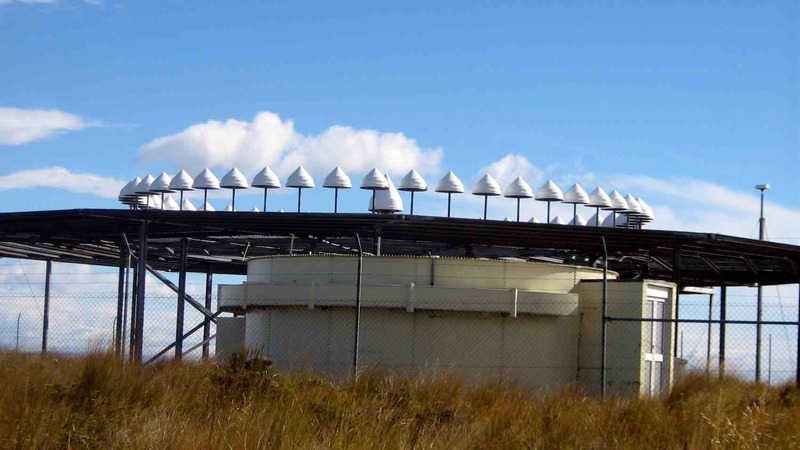 car park, made our way up the short climb to the Pipeline track, where we turned right, & walked along to the short track leading to the Intake for the pipeline. We thought this was the entrance to Burns track, as Hamel’s book states that the entrance is hard to find. 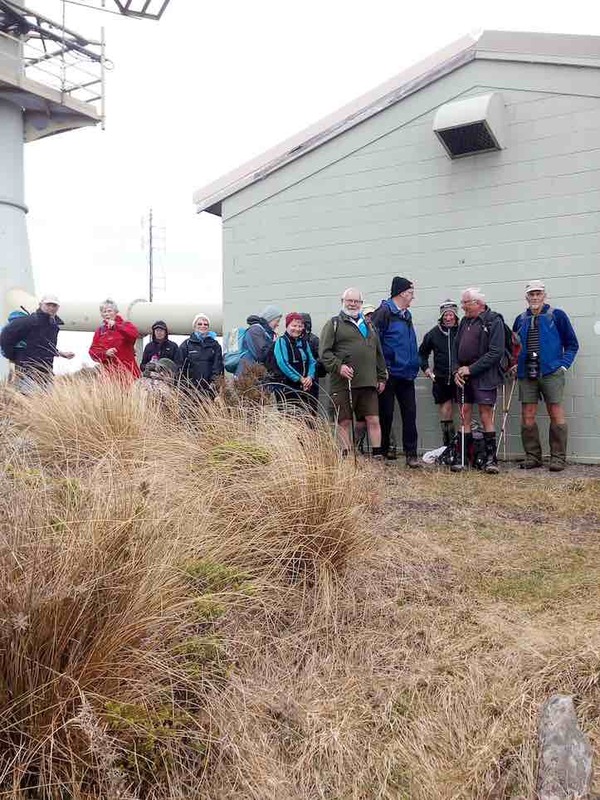 However, we soon ran out of track, so retraced our steps, & walked further along the Pipeline track until we found the large sign proclaiming Burns Track, & this was where we had morning tea. 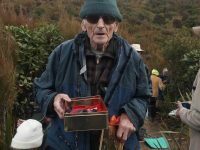 As we were making our way up to Burns saddle, we came across two Green Hut track workers, who were doing a great job of track maintenance. 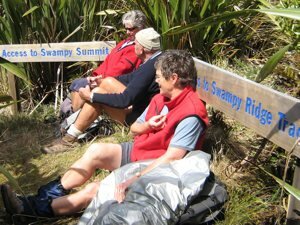 The climb up to Burns saddle is quite steep, but with a few rest stops we all made it ok.
After some discussion, we decided to take the track to Swampy Summit, & have lunch at the Airways building at the start of the Swampy Ridge track. 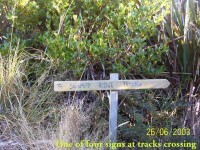 After lunch we walked along the Swampy Ridge track till we found the sign at the top of Burns track. We followed this sometimes muddy/swampy track back to the Burns Saddle, & then took Rustlers track back down to the Pipeline track. This was also a bit muddy in places, so I don’t think anybody got home with clean boots. From here it was just a walk back along the Pipeline track [also a bit muddy] back to the cars. There were some tired bodies at the end, but all enjoyed the walk on a very nice [25° C] day to be out tramping. 29. 4/2/2015. Both. Leith Saddle, Swampy Spur, Transmitter Tower. Leaders: Ian, Jill. 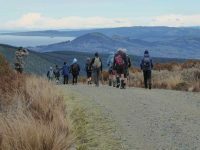 Twenty-three of us turned up for the scheduled Leith Saddle Track route. 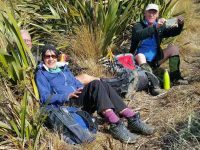 To accomodate our differing individual climbing speeds, the leaders advised us to climb at our most comfortable rates, to all meet at the view point seats for the morning cuppa. After a sociable meeting, Jill led us on again, ever onwards and upwards. However rain set in, getting only heavier and colder with even some hail appearing. And it did get HEAVY. 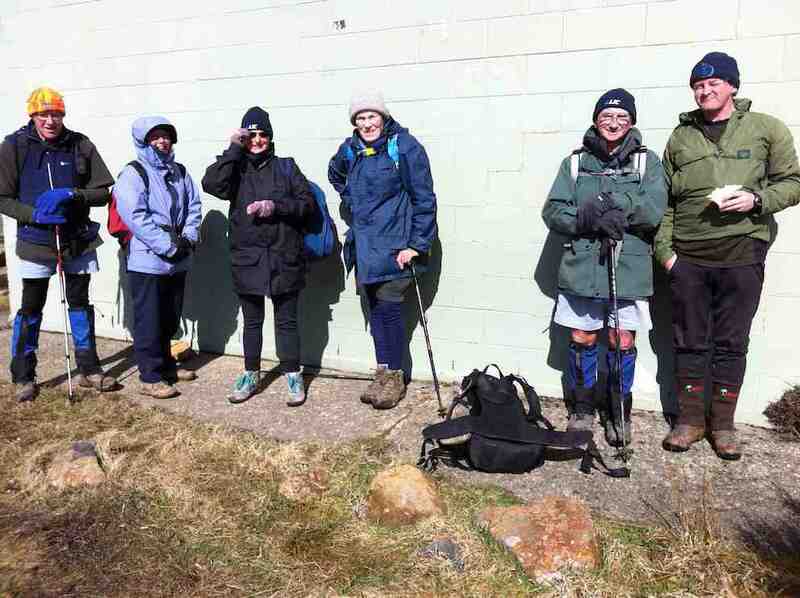 At the trig on the exposed Swampy Spur, the wind was so fierce that leader Jill made a prudent decision, given the uncertain outlook at the time, for the Hikers to turn back, allowing seven Trampers among us to carry on. Unbeknownst to us at the time, the worst was over and the storm was passing. 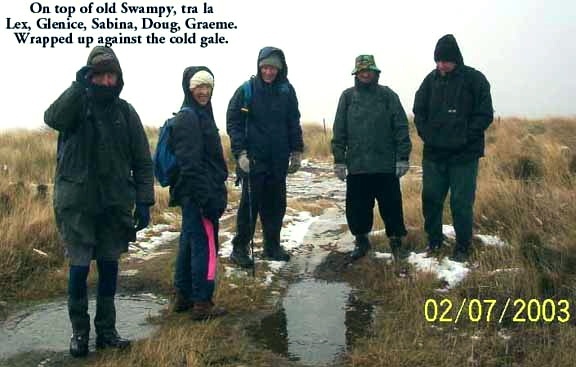 For the Trampers, of course, there was the immediate shelter in the dip in the track beyond the Trig, where it drops down from the Swampy Spur. 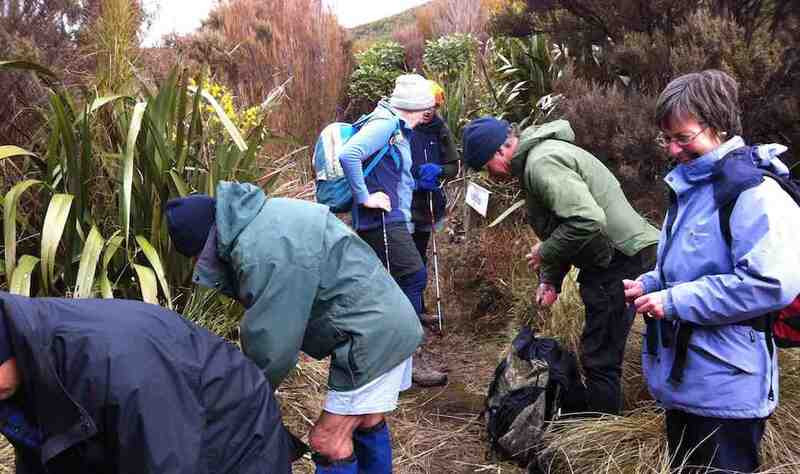 For the Hikers, it was back down into the shelter of the bush. 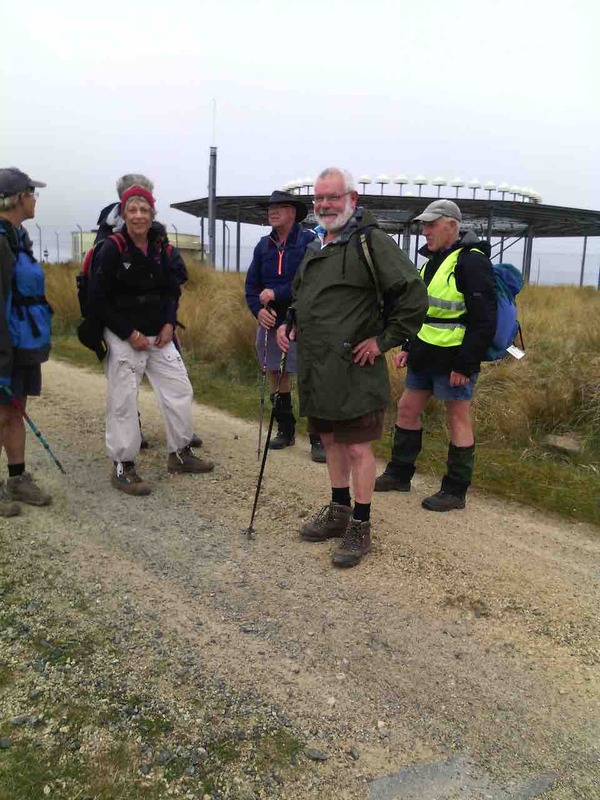 The Trampers reached the Telecom Tower on Swampy Ridge. 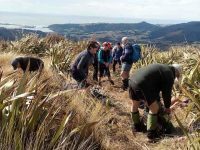 The possibility of going on along Swampy Ridge to the point where the Rustlers Ridge track turns off, and returning along the Burns track was complicated with one or two of the party being found to be part of car loads with Hikers who were already returning back. Meantime the Hikers had spent some time down at the Lookout, allowing all to regroup and make sure everyone was all right. As it turned out, Elaine had taken a fall on one of the wet wooden step side edges but was still mobile. 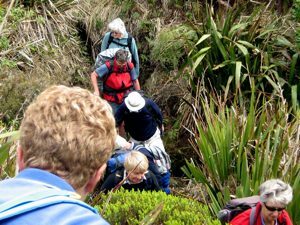 During that time, the Trampers caught up on the Hikers just as the latter were setting off down again. At track’s bottom, we separated. A few stopped off nearby to lunch in the sun. 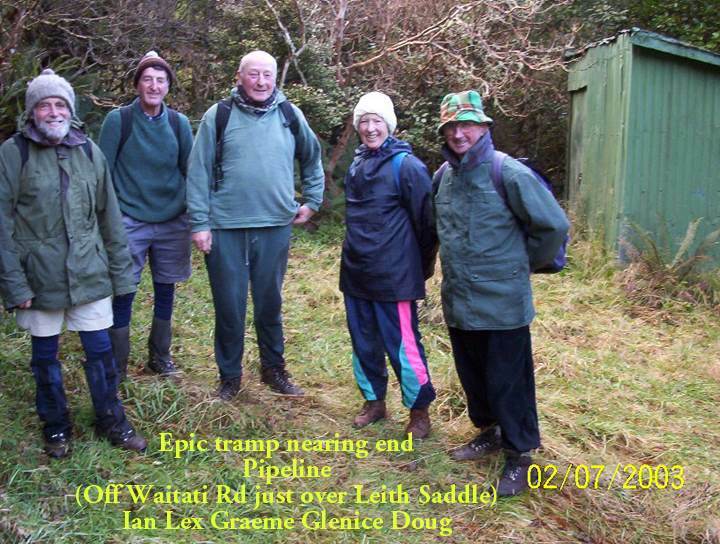 Several Trampers, (whose car-loads were not complicated with some Hiker passengers), set off down the Waitati Road and along the pipeline track to take a look at the end of the Burns Track for those among them who hadn’t seen it before. The majority of the Hikers lunched at Sullivan’s Dam in calm sunny air on a nicely warmed-up concrete slope. Somewhat approaching a dozen caught up on each other at Topiary’s later for a convivial coffee. An interesting day. A different day. All ended well (except for Elaine). – Ian (for the leaders). 28. 5/12/2012. Both. Leith Saddle. Leaders: Bev and Leslie. 27. 13/11/2013 Trampers. Leith Saddle, Swampy, Rustlers, Pipeline tracks. From the Leith Saddle we went up a very well constructed and maintained track to the picnic area (where the seats are) where we had our morning tea. In the quiet, the roar of trucks on the motorway was very noticeable. We encountered fog from that point on, very light of course, but when we got to the top it was clear only at the place we were and a short distance ahead. We passed the place where it seemed the aliens had landed (the airplanes navigation complex) and headed down the track that that led to the junction of the Burns and Rustlers tracks. We lunched about halfway down Rustlers in a good sheltered spot. 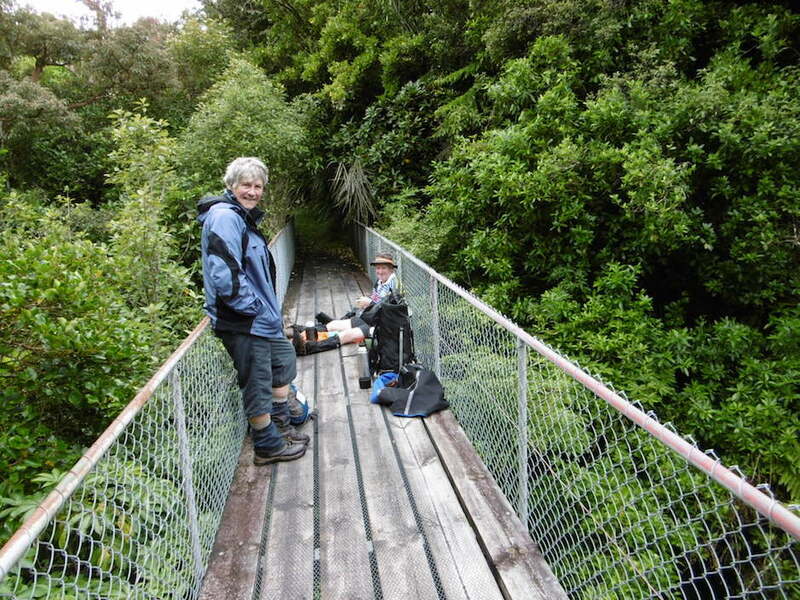 We eventually got down to the bottom and headed along the almost flat pipeline track. The end part of it was mown grass! Instead of heading down the farm track we continued right ahead, across the bridge and out onto the road and back up to the car. I must say all track signs were very clear. – Heb. 26. 14/9/2011. Trampers. 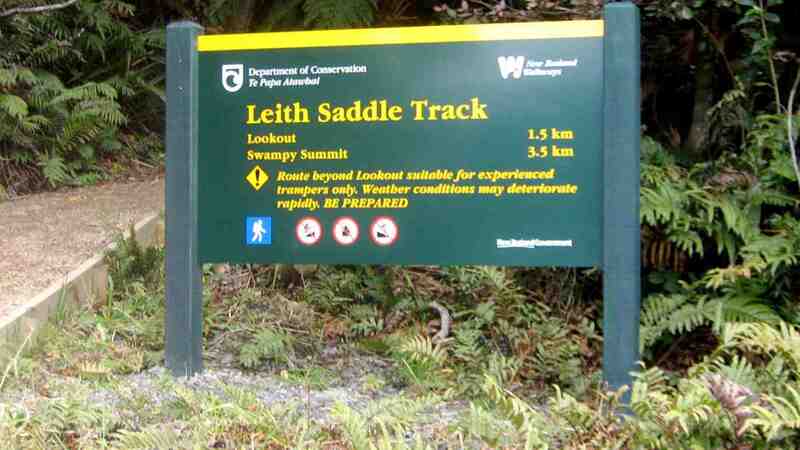 Leith Saddle, Swampy, Rustlers, Pipeline tracks. 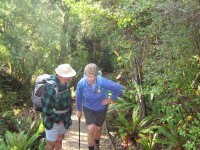 Bush sheltered us for the first bit along the now step-less, if still steep in places, beautifully gravelled DoC track. It looks like what one of us said that those in the UK would disparagingly call a Yellow Brick Road or pedestrian motorway. Perhaps however, the only practical way to overcome the bush underfloor condition. Even beyond the bushline, the track was still wonderful underfoot, accompanying and crossing only muddy traces of the original. Here we took our ‘cuppa’ on the lookout seat there, after wiping the remaining snow off it. 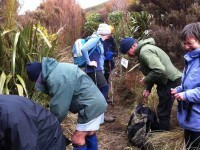 Now we were exposed to the gale coming straight up from the Antarctic as we tackled the steep hill-side beyond. 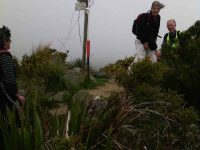 At the Swampy Ridge Trig, we were exposed to the wind blustering from our left so much so that we were blown off our feet. It was a relief after negotiating past the trig’s stay-wires to slip down through the rocks into the comparative shelter of the dip beyond. Across the dip, the last bit of a climb and we scurried into the shelter of the Post Office building. 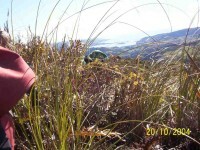 We had planned the clockwise direction so that the wind would be behind us on Swamp Ridge. Well, not quite behind us, more on our left shoulders. But it was still preferable to battling it head-on. Once we turned off onto the track linking down to the Burns/Rustlers junction, the wind was now more comfortably behind us. Relief. And then when the track started its plunge down from the tops, – no wind. Ahh. Had it stopped or were we just sheltered? We should pause here to acknowledge the benefit of the most magnificent track-clearing work we have ever experienced on this track. Bravo. 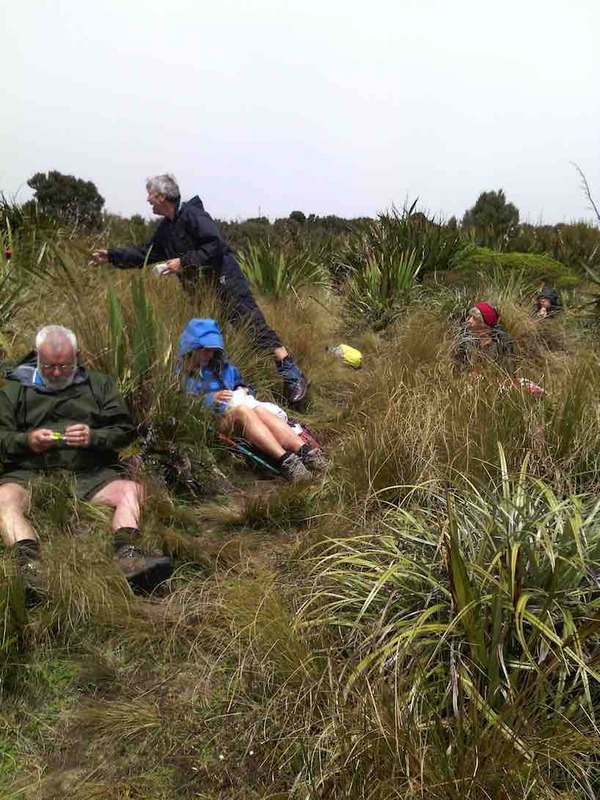 Where tussock, celmisia and flax often used to overhang and impede, the track was open all the way! In fact, when we got to the steepest and slipperiest part just before the junction, it was hard to find anything left to hang onto! At the junction, all was sheltered and most pleasant with bits of sun shining through. We lingered for a while after lunch. 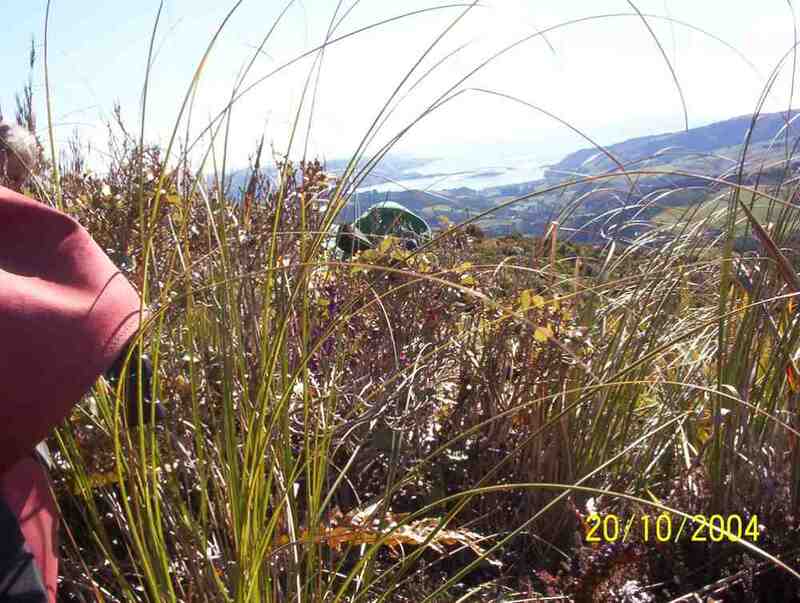 Rustlers had been cleared too, but it was the same old Rustlers Ridge, tree-rooted and bits of bog in places. Then we were down on the contoured Pipeline track, level – did I say level? – all the way except for its now many ups and downs. And its boggy bits get not better. Except, that someone has where possible put sodded tracks alongside some of the worst of them. Except for the following one. 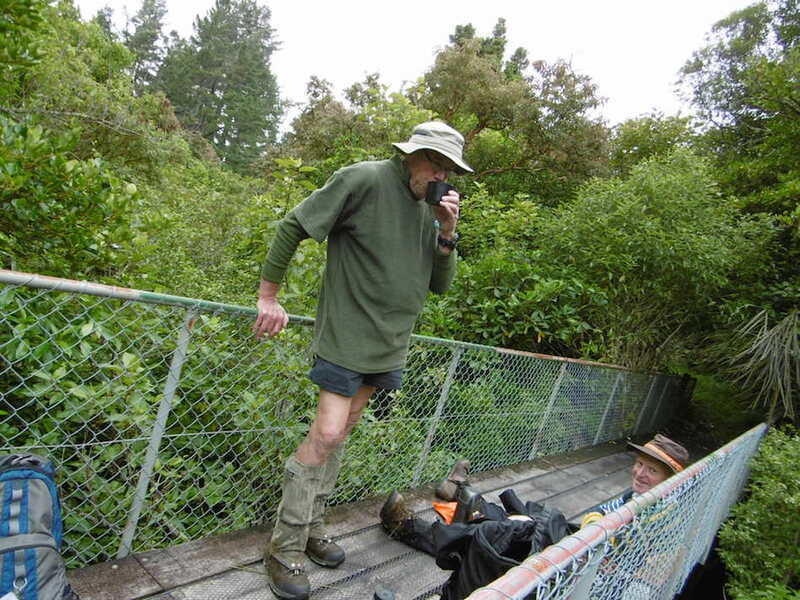 Remember the detour that led around to the Burns Creek weir crossing? Well, it’s still there, but now relegated to redundancy. The former disused track that lead down to the old non-existent bridge, has been reopened and steps dug down into the creek and back up the farther side. Whom to thank for all the track work we benefited from today? 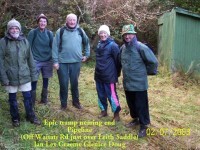 The Green Hut group? Task Force Green? Well, thanks all, anyway. You made it all so much easier and pleasanter. 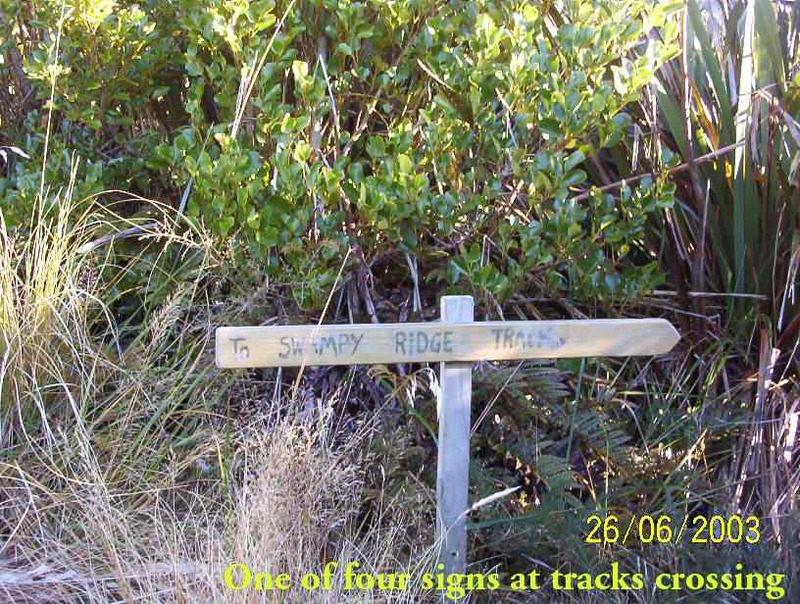 Then it was just onto the really level part of the Pipeline track, past the foot of the Burns Track, out the old Waitati Road and up the cars. As you can see from the pics, we were well wrapped up, we survived and enjoyed a good workout. – Ian. 25. 24/3/2010. Trampers. 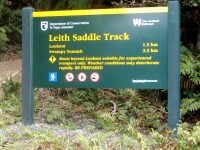 Leith Saddle, Swampy Ridge Track, return Burns Track, Pipeline Track. Moderate. Today was the first time we tried out the track since it had replaced the steep stepped boardwalk two years ago. It turned out to be an excellent tightly-packed gravel path bordered all the way to the lookout with staked sides. 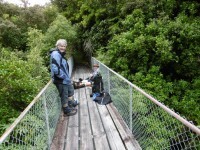 In contrast to the former stepped boardwalk, (a few of whose boards had also suffered breakages), we encountered no steps until well up the hillside. (This didn’t exclude some quite steep slopes also at times.) But what a path! Doug and Sabina stop for a chat on the track. On the steeper slope past the lookout excellent steps had replaced the former scramble. It was gravel with occasional heavy metal all the way, past Swampy Spur right up the telecommunications tower at the top. Further on, as we turned off swampy to go across and down to the Burns Saddle for lunch, we found the track to be beautifully cleared for most of the way. Thanks to the clearers. 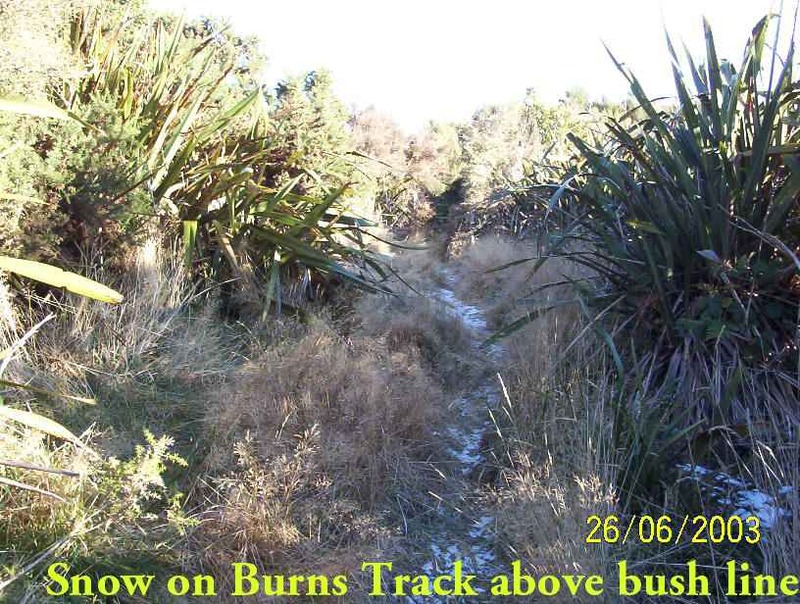 We found parts of the Burns Track well cleared also, but prior to entering the bush it was so heavily covered by what appeared to be rank hook grass (but fortunately seedless at this stage) that we could detect the track only by pushing through by feel. Down at the bottom, the pipeline track had been recently mown making for easy walking. Then it was up the road and back to the cars. Seven of us ventured out. It was a good day. – Ian. Once again the weather forecast was chancy but nine of us had the best of the day, striking rain just as we got back to the cars at the end. From just a little way down the Waitati road from the Leith Saddle, by a bridge where we parked our cars, we made our way up to and then along the nicely level Waitati-Leith pipe-line track (that takes water to Sullivans Dam), passing the foot of the Burns track and going further along to the Rustlers as we had decided to do the circuit anti-clockwise this time. Rustlers proved well cleared and we made our way easily up to the crossing junction of the 4 tracks, viz. Rustlers Ridge (and the extension of Rustlers up to Swampy Summit) and Burns (and the Burns extension to the Swampy Ridge track further north) and early-lunched at 11.30 a.m.
22. 24/10/2007. Trampers. Rustlers, Burns. Medium. Leaders: Wendy and Peter. 19. 20/10/2004. Both. 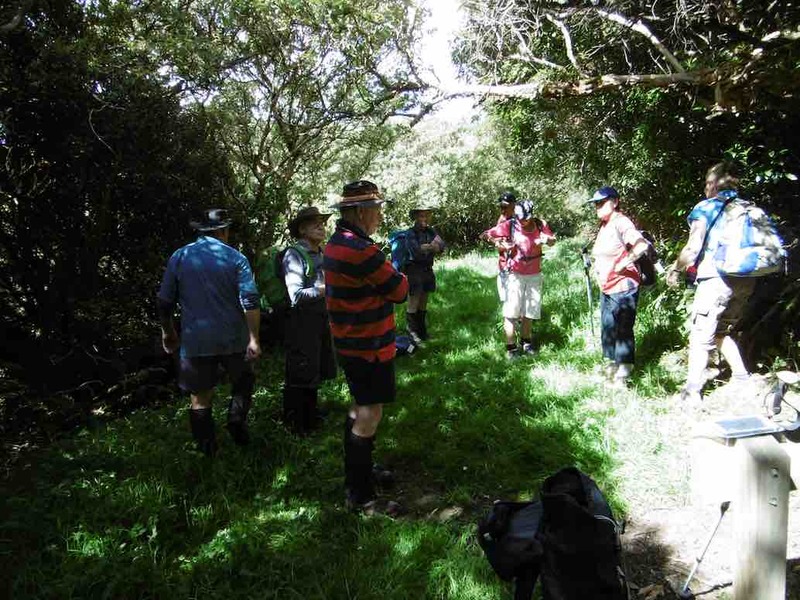 Leith Saddle, Swampy Spur, return Burns Track. Leaders: Barbara M, Val, Arthur and Barbara. 18. 2/7/2003. Trampers. Burns – Rustler Track. Medium. Leaders: Lex, Ian. 17. 25/9/2002. 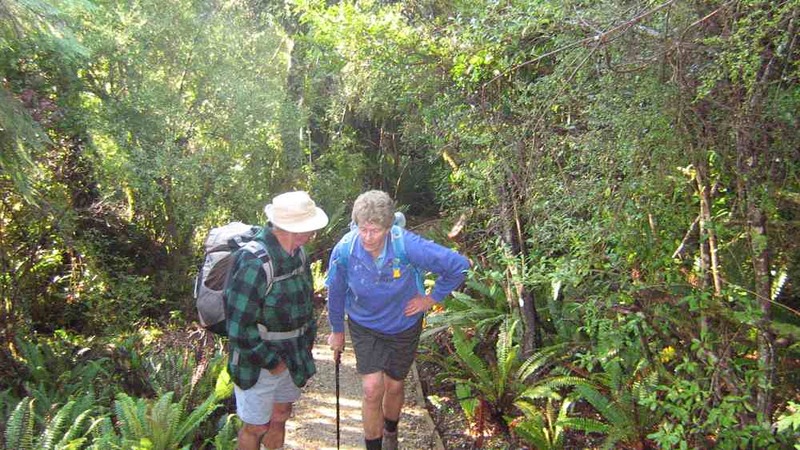 Leith Saddle – Rustler Track. Medium. Leaders: Hazel, Bill and Pat. 16. 8/5/2002. Alt. Burns – Rustler. Medium. Leaders: Nancy, Joyce, Val. 15. 26/9/2001. Leith Saddle, Rustlers. Medium. Leaders: Claude, Les and Margaret. 14. 31/1/2001. Rustler – Burns Track. Leaders: Nancy, Frank and Lesley. 12. 12/7/2000. 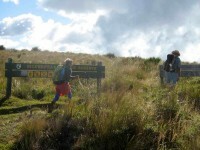 Leith Saddle – Rustler Track. Leaders: Bob H, Shirley McN, Val. 11. 9/2/2000. Burns – Rustler Track. Leaders: Eleanor, Bev McI, Daphne. 9. 10/2/1999. Burns – Rustler Tracks. Eleanor, Nancy, Lesley S.
8. 30/9/1998. 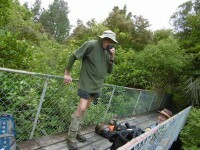 Pigeon Flat, Swampy, Burns Track. Leaders: Ted, Les W.
4. 30/8/1995. 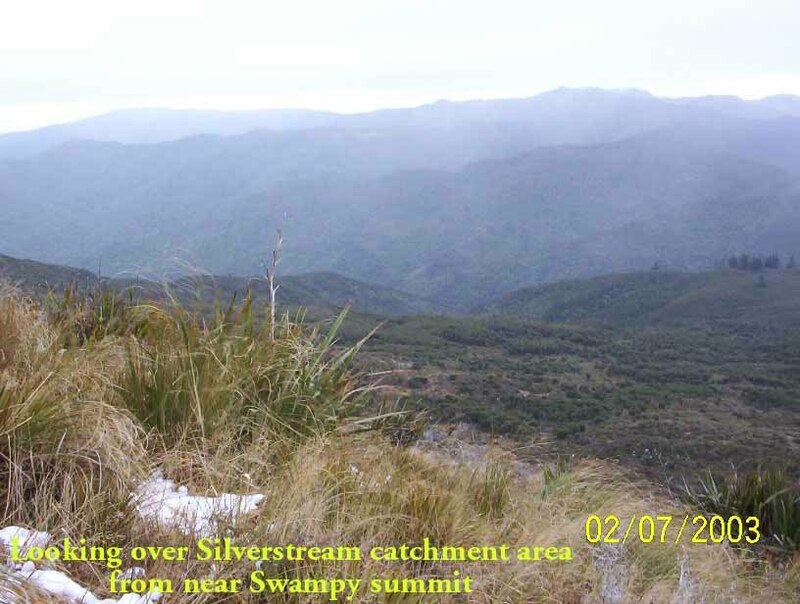 Pigeon Flat, Swampy Spur, Burns Track. Medium+. Leaders: Bob H, Doug and Ngaire, Ted.